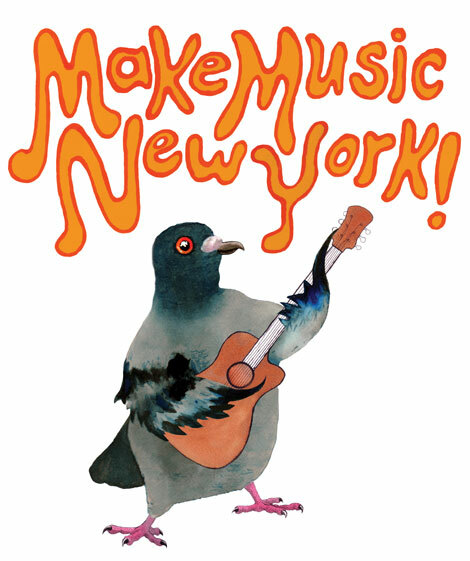 Now in its fourth year, Make Music New York, “the largest music event ever to grace Gotham” (Metro New York), is a unique festival of free concerts in public spaces throughout the five boroughs of New York City, all on Monday, June 21st, the first day of summer. MMNY takes place simultaneously with similar festivities in more than 327 cities around the world — a global celebration of music making. From 11 in the morning to 10 at night, musicians of all ages, creeds, and musical persuasions — from hip hop to opera, Latin jazz to punk rock — perform on streets, sidewalks, stoops, plazas, cemeteries, parks and gardens. From high school bands to marquee names, MMNY is open to anyone who wants to take part, enjoyed by everyone who wants to attend. Along with the hundreds of individual concerts, MMNY includes a number of special projects: “Mass Appeal,” where hundreds of musicians band together to perform massive pieces written for a single type of instrument; “Punk Island” on Governors Island; and more to be announced soon.